Mayang ( "Mayang Miao Autonomous County", simplified Chinese: 麻阳苗族自治县; traditional Chinese: 麻陽苗族自治縣; pinyin: Máyáng Miáozú Zìzhìxiàn; usually referred to as "Mayang County", simplified Chinese: 麻阳县; traditional Chinese: 麻陽縣; pinyin: Máyáng Xiàn) is an autonomous county of Miao people in Hunan Province, China, it is under the administration of the prefecture-level city of Huaihua. Mayang is located on the west central margin of Hunan Province, adjacent to Guizhou Province. It borders Bijiang District of Tongren, Guizhou to the west, Fenghuang County to the northwest, Luxi County to the northeast, Chenxi County and Hecheng District of Huaihua to the southeast, Zhijiang County to the south. The county covers 1,568.19 km2 (605.48 sq mi), as of 2015, It had a registered population of 403,400 and a resident population of 349,000. 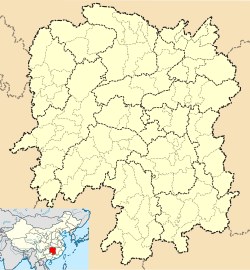 The county has 7 towns and 11 townships under its jurisdiction, the county seat is the town of Gaocun (高村镇). ^ Google (2014-07-02). "Mayang" (Map). Google Maps. Google. Retrieved 2014-07-02. ^ Huaihua City Land Use Plan (2006–20)/《怀化市土地利用总体规划（2006-2020年）》. (in Chinese) Accessed 8 July 2014. ^ 怀化市2010年第六次全国人口普查主要数据公报 (in Chinese). 怀化市统计局 [Huaihua Bureau of Statistics]. Archived from the original on 14 July 2014. Retrieved 9 July 2014.